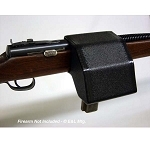 Top Rail Mounted Brass Catcher mounts to rifles with picatinny rail along the top of rifle handguard. 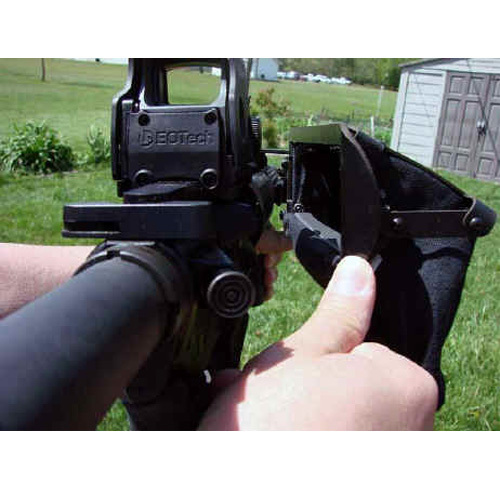 Not recommended for rifles with objective bell scopes having less than 3/4" clearance between handguard and objective bell. 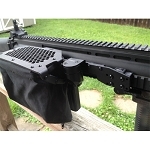 This model is intended to utilize the picatinny rail along the top of the rifle handguard when no other options are available like the example shown. 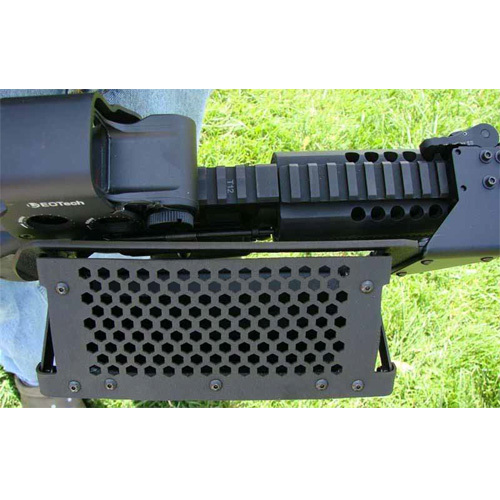 High Capacity-will hold over 120 .223 Remington cases! Collapsible-folds up to give a low profile when not in use or stored. 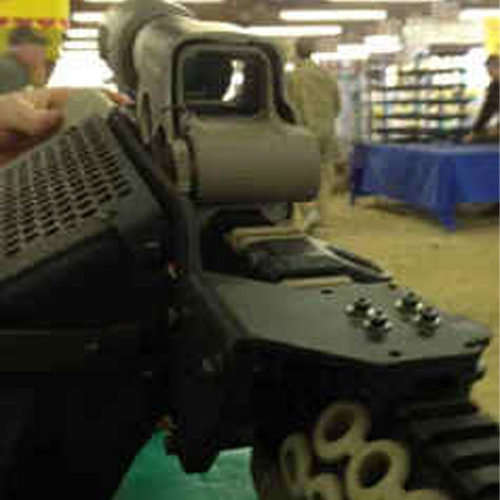 Offset design allows shooter to observe and access the chamber in the event a malfunction needs cleared. 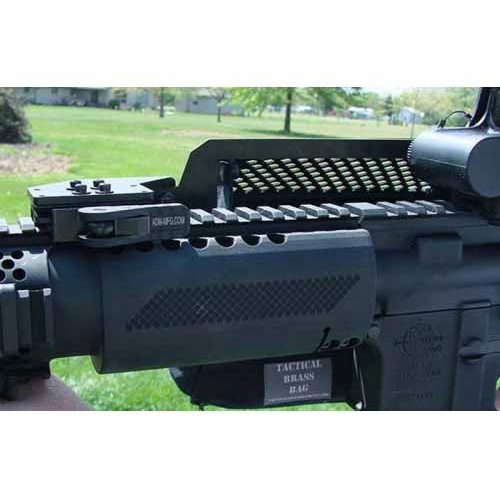 Bag design allows for dissipation of gases coming from ejection port to avoid obscuring view or irritating your eyes! Won't scratch your rifle's receiver! Made from durable/flexible, solvent resistant ABS plastic. 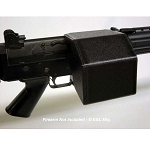 Will not interfere with your choice of optics or mounts. 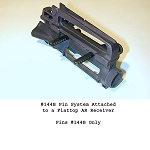 Tool-less throw lever mount for picatinny rail so it will not sag under the weight. Made from durable/flexible, solvent resistant ABS plastic. 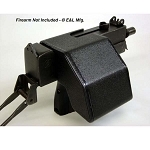 Our mission is to sell a tactical brass catcher for AR style rifles that will catch the spent brass casings in a range of environments from the casual day out shooting to the covert operation when leaving a trail is not an option. Anybody can stick a bag or a box on a rifle and call it a brass catcher, your money is worth more than that! TBR's competitors like to use the word "Tactical" because it sells, don't be fooled. 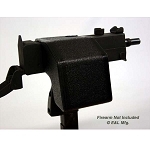 Any brass catcher that has to be removed to clear a malfunction or observe the chamber should not be called Tactical. We believe it is just as important to have the ability to deal with a function problem as it is to catch the brass. That is why our products represent an excellent value to our customers. TBR designed the Tactical Brass Bag with the competitive shooter, hunter, hobbyist, and covert operator in mind, drawing on our own experiences and input from other like minded professionals.